Everyone knows the Tisza shoe (check out the article Tisza Cipő), but we have our own denim, too! In the socialist era, everyone wished for jeans, but it was a privilege of the west. 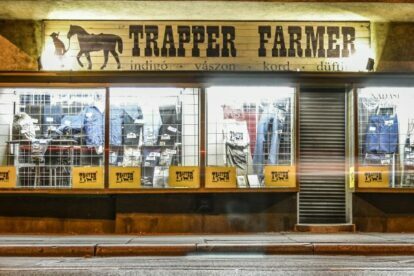 So we made our own jeans brand, the Trapper: the Hungarian Trapper was a response to the capitalist Levi’s in the socialist era. Sándor Nádasi, the manufacturer and merchant, makes the material for the pants with the patterns he designs. (Urban legend: it’s said its pattern was created by copying a Swiss brand called “Bob”). For Mr. Nádasi, the quality is much more important than the money. They have plaid shirts too, so if you are a lumberjacksexual, this is your place.